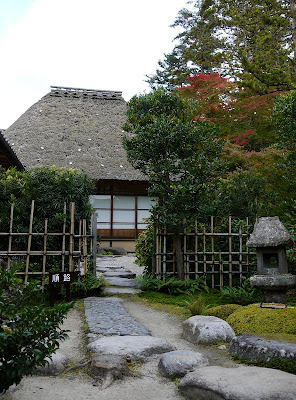 The front garden was originally part of Manishu-in, a minor temple which was part of the Kofuku-ji Temple. The ground was bought in the 1670s by Michikiyo Kiyosumi, a wealthy man whose profession was to deal with bleached or dyed cotton and hemp cloths. 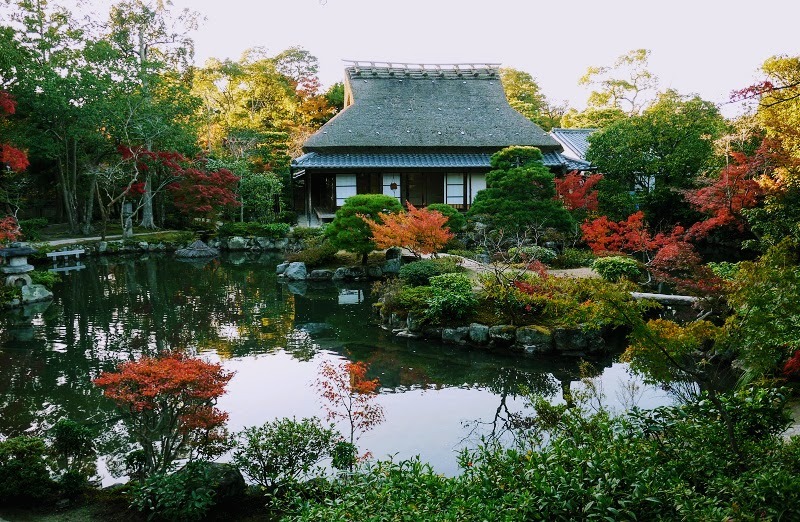 Michikiyo restructured the gardens and built the pavilion 三秀亭 Sanshutei. This is the view of the front garden you see first after paying permission. While strolling, I'll be quiet as much as possible so that your senses be opend up. 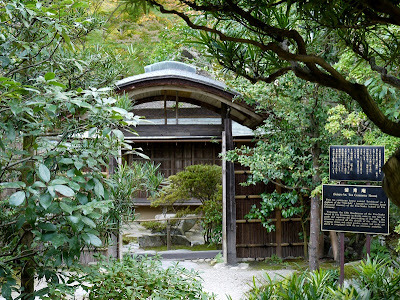 Entrance to tea ceremony house named 清秀庵 Seishu-an. A path leading to the back garden. 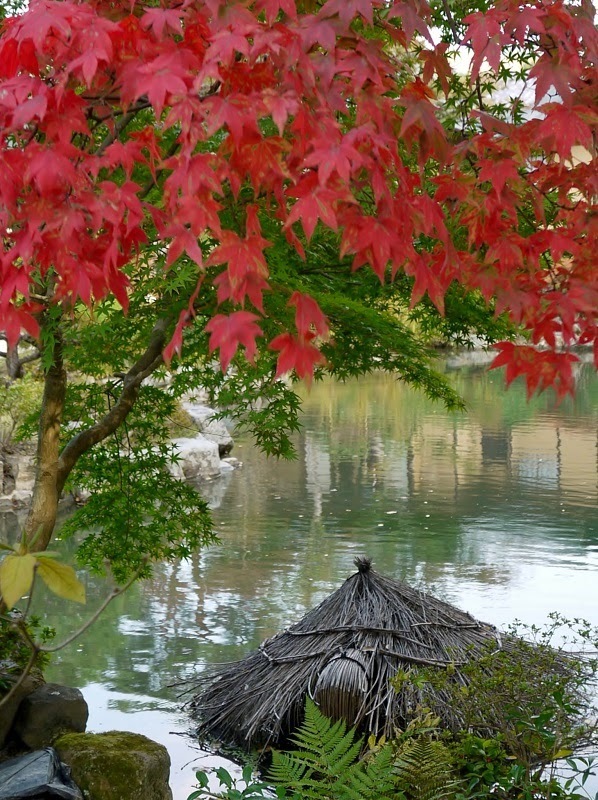 The Back Garden built in 1899 is only one 池泉回遊式, Strolling-around-the pond style garden, in Nara. The mountains of Wakakusa and Kasuga and Todaiji Temple’s Nandaimon Gate are used as “borrowed scenery". The mountains give more depth to the scenery than the actual depth of the garden. The right side is connected to the forest of Himuro Shrine and the left side to that of Todaiji Temple. The central island is connected to the bank by a series of stepping stones. The stones were formerly used to grind the pigments used in dyeing. 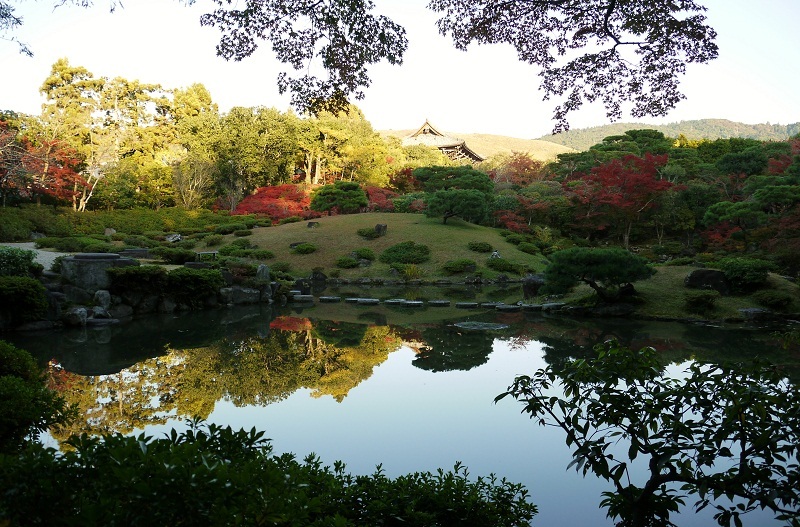 依水園 Isuien means “garden founded on water”. The water of the ponds and brooks is from the small adjacent Yoshiki River. 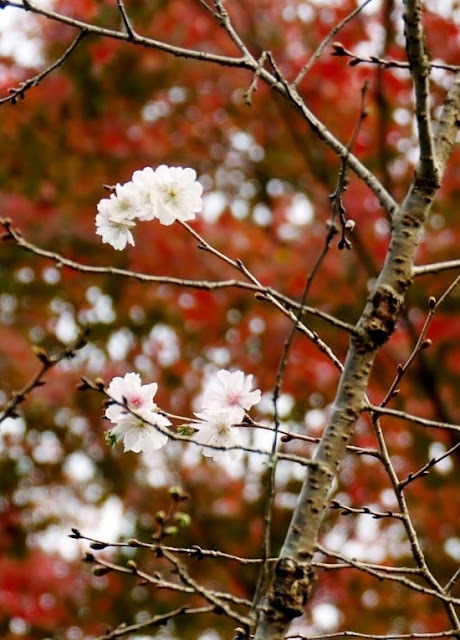 十月桜, October cherry blossoms, bloom modestly one after another till April. and then gradually gets muted in colors in the cold wind. Right after the last posting, my mother-in-law got hospitalized for emergency and died of septicemia in two days on Novembter 3rd. It all happened so sudden but I woldn't grieve so much because she didn't suffer long with lots of tubes at the hospital. She accomplised her 90 years. In her youth, Nara Park was like her garden as a student of Nara University of Education, and the Isui-en Garden was one of her favorite sites all her life. On the other hand, my mother who turned 93 on 11th have just started having chemotherapy for her cancer, believing the treatment is for her fragile bone. My heart aches as she suffers in silence. Both of loved mothers are in my prayers and thoughts. Thank you, my Friends, for all of your concern. Right after the posting, we children decided not to let our mother have any chemotherapy, even the soft one to the elderly. We hope cancer be very-slow-developing at that age. So sorry to hear about your mother-in-law and your mother. That park is so full of beautiful forms and colours. What a superb garden. Nature often gives solace in times of loss and worry. Take care. My dear Yoko, I am deeply saddened at your loss and the predicament of your mother with all the accompanying disturbing thoughts. So lovely that you have posted this superbly beautiful garden as a tribute to your mother-in-law. Autumn is such a gentle season, perhaps a good time to make the final journey. I am so glad I found you in this huge blogland, my life is all the richer for knowing you and seeing through your eyes. I sincerely wish you hope for your mother. Miracles still happen, not perhaps what we expect but miracles none the less. It's so nice there.....look at all these lovely colors..... it's a wonderful post Yoko. Sorry for the great loss. Those colors, Yoko... I love it very much!! Bardzo mi przykro z powodu rodzinnej straty. Teraz Twoja teściowa ogląda przepiękny ogród z nieba. Jest w raju i ogląda raj. Przepiękne zdjęcia. Pozdrawiam. I'm sorry for the family loss. Now it's your mother-in watching the beautiful garden of heaven. It is a paradise and watching paradise. Beautiful images. Yours. hi there, beautiful photos of a lovely garden! make me want to go there. first time here. i just loved your blog! (in fact. i stumbled upon your comment on another blog and thought i'd drop by to say hi. ...i am so sorry for your loss. i am so sorry for the loss of your mother-in-law, but agree with you - a sudden passing at that age is a gift to her and to those who love her. i hope for strength for your own mother. bless her as she struggles. as for this post, it is absolutely stunningly beautiful. 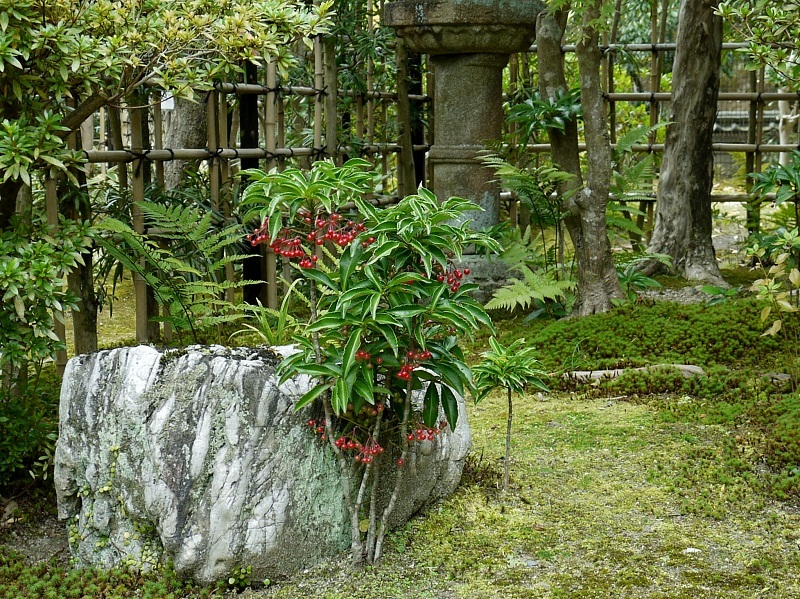 the use of the grind stones as stepping stones is wonderful. loved it all. So sorry to hear about both your beloved mothers. Thank you so much for the beauty of this post - so many gorgeous photos. Bautiful photos of the garden! Thank you, Shefi, for the introduction of this poem. I have only known the phrase by Tolkien “in every wood in every spring/ there is a different green”, which I learned from my British teacher. There is something sad and lonely about the passing autumn, yet I'm always moved by the final burst of life before decaying in the natural cycle. Nature always makes me in a reflective mood. Usually I don’t post reply, instead I visit the commenter’s blog to leave a comment, but your profile is not open, so I wrote here hoping you’d come back to read. So sorry to hear of the loss of your mother-in-law and of your mother’s lingering illness. The bridge from life to another possible realm can be difficult and long. Your melancholy scenes of the bridge and back garden set the perfect reflective tone as does the “I Sit And Think” poem by Tolkien from Shefi. 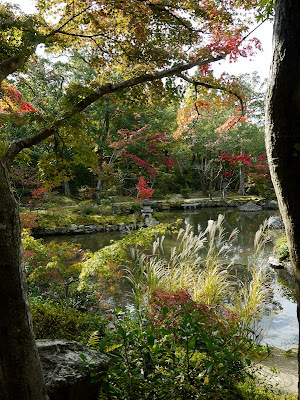 Dear Yoko, Your stunning photos of fall in Isui-en Garden leave me yearning to see it in person. The reds stand out amid the still-green landscape. 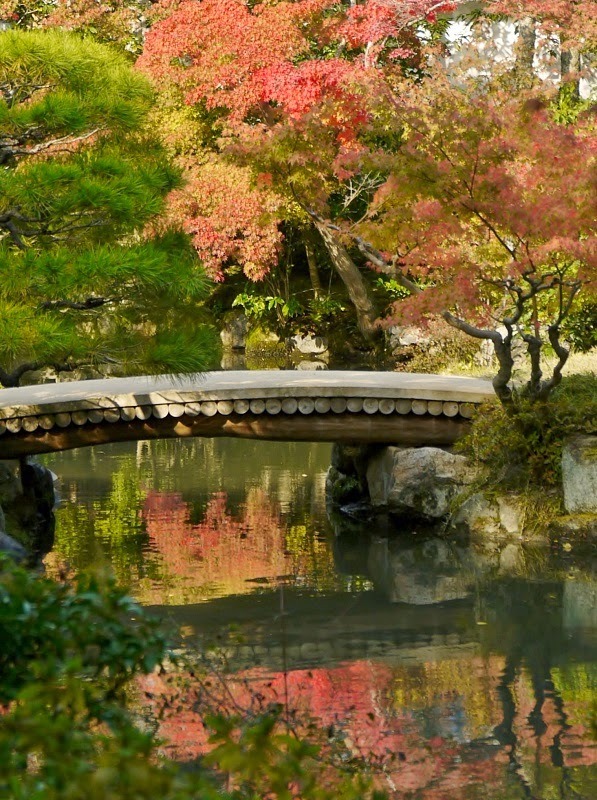 The bridge and reflections of fall are lovely metaphors of your mother-in-law crossing into a different realm. I know you must be worrying about your mother's treatment. My thoughts are with you at this time. I lost my mother in September. I still find myself picking up KitKats to mail to her, or reminding myself that I should call her. There's a disconnect between my head and my heart. I'm sorry to hear about your mother-in-law, Yoko-san. 気をつけて to you and your mother! Thinking of you in Tokyo! Beautiful photographs.... and I am sure that being there to see the autumn colours in person would be wonderful. My thoughts are with you. I am so sorry to hear of your sadness. Old age can be so hard. I am sending you a hug across the miles! 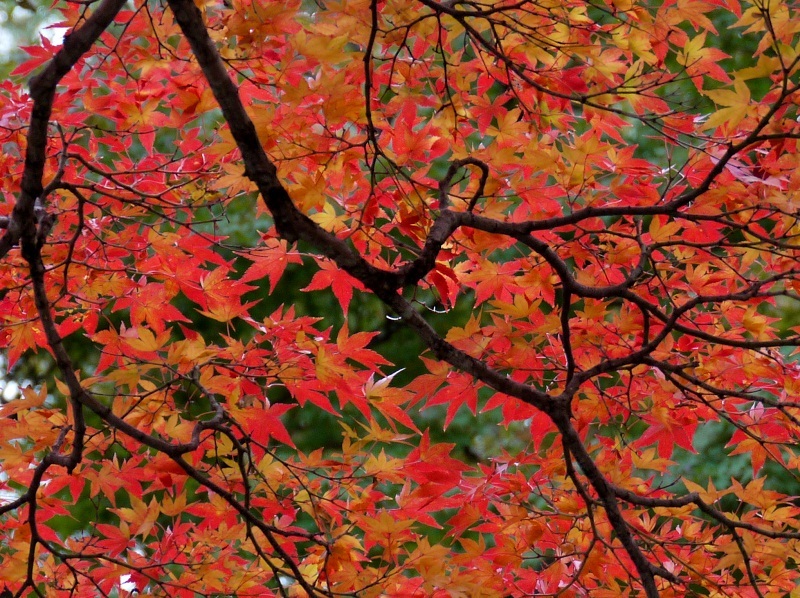 Beautiful post Yoko - the leaves glow red as only Japanese Autumn leaves can. I'm sorry to hear your mother is having chemotherapy in her frail state and hope it is not too distressing for her and you.It's not an easy thing for family and friends to witness. Sua imagens encantam com a grande liberdade de cores da natureza. I’m very sorry, Yoko, really. My friend is going through this treatment too now. God be with them both! 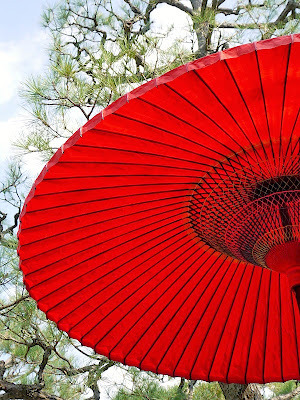 Incredibly beautiful Nara is! It's a pity you included few pics of tea garden. i love to spend my weekend there. I am sad to hear of your pain about your mother, it is so difficult to see one's mother suffer. But, it sounds as if she has chosen to have this treatment, and if that is the case, then she will be at peace in her mind about it. My deep condolences for your mother in law - this is a difficult time for you. 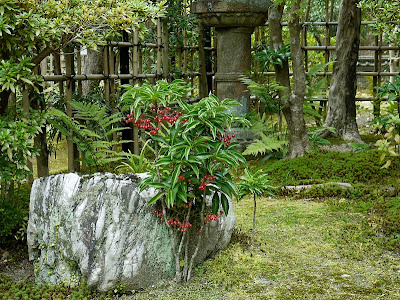 Of course nothing can take away emotional pain, but I do feel that contemplating a beautiful and harmonious garden, with every object reflecting the beauty of nature carefully arranged by man, is good for the spirits and very calming. 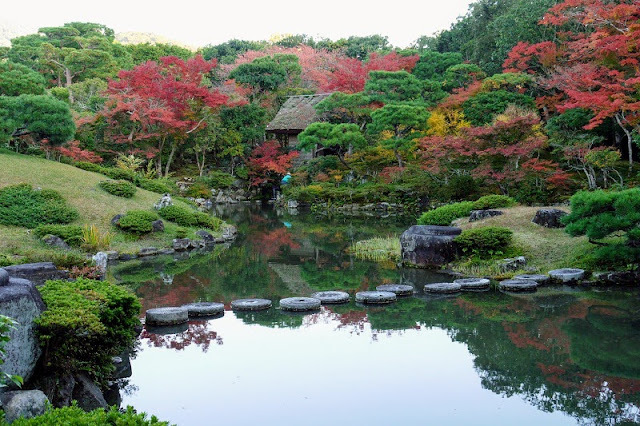 I have seen many wonderful gardens in England but never anything as calm and elegant and peaceful as Isui-en Garden. All of your pictures are, as always, beautiful. 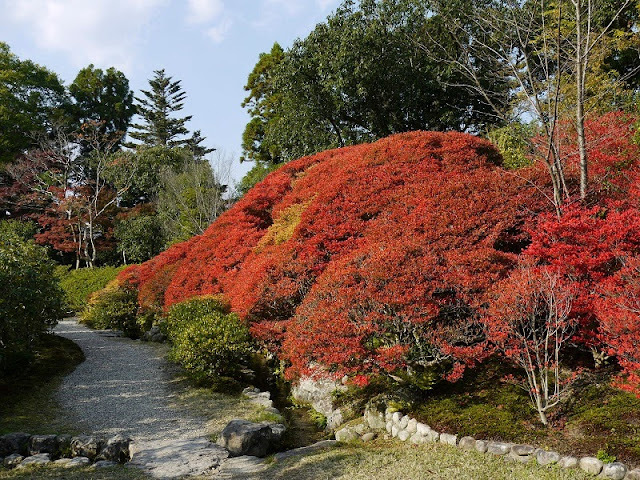 I particularly like the one showing the colours of the bushes and trees with the backdrop of mountains behind the stepping stones connecting Himuro Shrine and Todaiji Temple. Dear friend! Definitely both of us are very busy these days (though of different reasons) and don't have too much time for blogs and blog friends. But that's OK - family members "of flesh and blood" are more important! 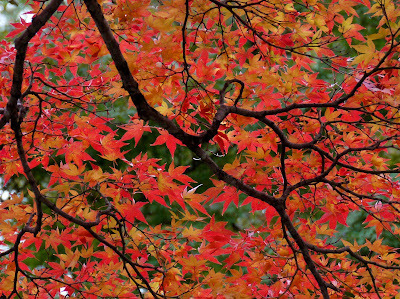 Although you had so many sad affairs the entire time, your blog post about Isui-en Garden is beautiful and enchanting and I like the autumnal colours of your trees and bushes very much, German maple - officially known as Norway maple [Acer platanoides] just changes its colour to yellow, while the Japanese species has these wonderful red tones! I think about you and your family these days - and I hope it's a scrap of comfort. Wishing you strength as you deal with your mother's illness and my sympathy for the loss of your mother-in-law. 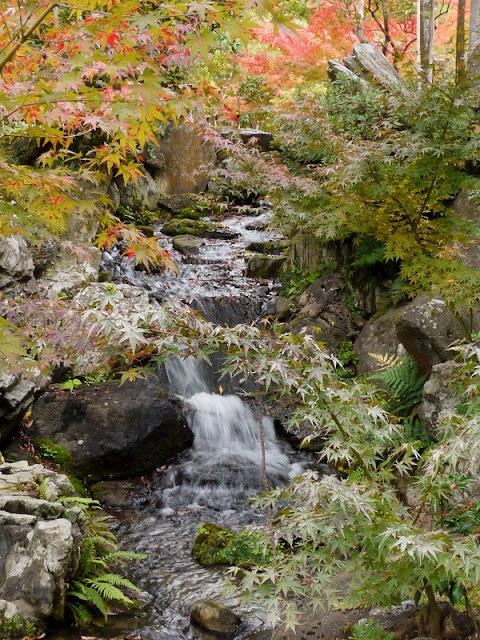 These gardens must be a source of serenity. 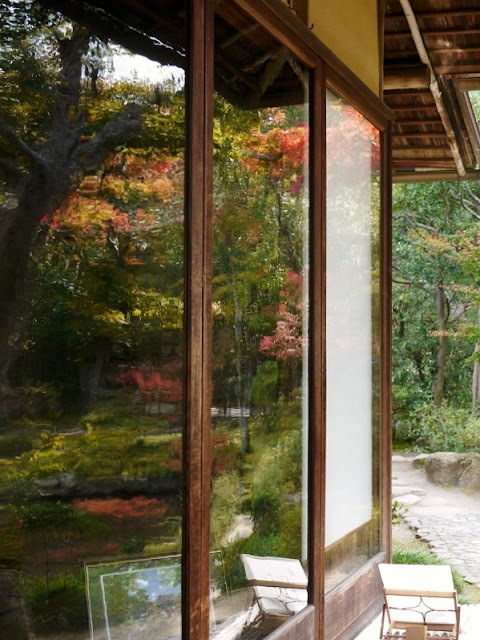 These photographs are beautiful and tranquil. The water is so still. sunlight and the fantastic reflections. As I've mentioned previously, you are a superb photographer and it would be wonderful if you could put together a "coffee-table" book of your photos. I think it would sell very well in the west because your photos open up another world in which so many (myself included) have never had the opportunity to experience. I do not know if this is a holiday season for you but Lois Anne and I extend our best wishes to you and your family and I know Lois Anne will hold you in the "light" as you care for your mother in the days ahead. I'm sorry and I hope the weather will cure and heal the difficult times. surface in front of your pain. Excuse. Thank you for visiting my blog because it has led me to yours, with its wonderful garden photographs. What a difficult time you are having. I hope the beautiful garden will give you peace.